Family travel not only expands children’s awareness by exposing them to a different culture and way of life but can also enrich their life skills, teaching them to be more understanding and compassionate towards others. Beyond its postcard-pretty palm-fringed beaches, there is much to see on Thailand’s second largest island of Koh Samui. Spend a full day exploring the island’s unspoiled forested interior in a 4×4 off-road Jeep, visiting both natural and spiritual highlights. See the Na Muang Waterfalls, a set of two cascades that empty into a natural pool. 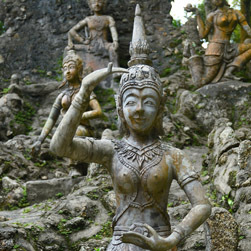 At the Tar Nim Waterfall, spend some time at the enchanting Secret Buddha Garden filled with moss-covered statues. 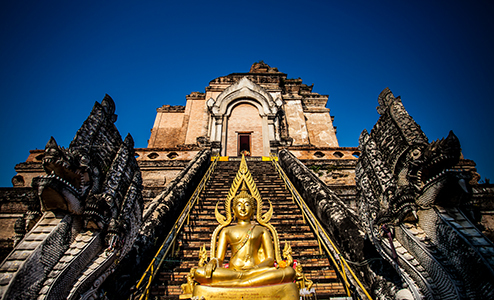 Also visit two religious sites: a Walking Buddha statue built during the Sukhothai era and the Khao Hua Jook Temple, known for its replica of Buddha’s footprint. A climb up to the golden pagoda 90m above sea level is rewarded with sweeping views of Chaweng Beach. The day includes a Thai set lunch served at a mountaintop restaurant with panoramic views over the nearby islands. Chiang Mai has a long and storied history, stretching back more than 700 years, making it one of Thailand’s most historic cities. Established as the capital of the kingdom of Lanna or “Kingdom of a Million Rice Fields” in 1296 by King Meng Rai, Chiang Mai reached its peak in the 16th century, when the Lanna kings ruled territory as far east as present-day Nan Province, south to Sukhothai and north to the present-day Myanmar-China border. Embrace your role as a historian in an interactive role-playing game, searching for clues based on Chiang Mai’s history to help locate a colleague who mysteriously disappeared. 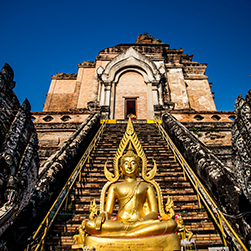 Among others, learn about the 15th century Wat Chedi Luang, one of the city’s most recognisable landmarks, as well as the history of the Golden Triangle, while engaging in this fun, educational experience. 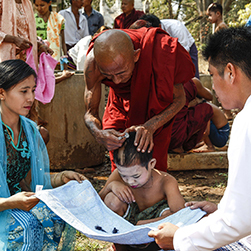 The Burmese word “kyaung” refers to both school and monastery, highlighting a nearly thousand-year tradition of monastic schools operating both educational and religious activities for the local community. Today, nearly 1,700 monastic schools provide education to over 300,000 children across Myanmar, helping to fill a gap in the public educational system. These schools use the same curriculum as government schools to teach students coming from remote or conflict areas, children with disabilities or otherwise disadvantaged backgrounds. Visit the Shwe Gu Monastic Education Centre where hundreds of novices from different ethnic groups across the country are taught by monks and volunteer teachers. Spend time learning about the monastic school system and getting to know the students with the opportunity to donate school bags, stationery, umbrellas, textbooks and school uniforms directly to the children. “To be Burmese is to be Buddhist” is a well-known Myanmar saying speaking to the integral role religion plays in the life of every Burmese. In fact, according to Myanmar’s Buddhist traditions, all males are expected to join the monkhood at least once in their life, marked by a novitiation ceremony. Spend a full day with rare, behind-the-scenes access to this coming-of-age rite where young boys become temporary novices for a week, a month or forever, and girls choose between having their ears pierced or shaving their heads and becoming a nun. 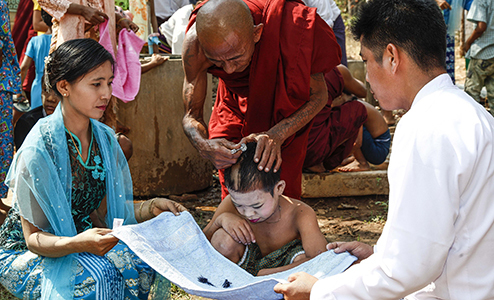 Witness as the children are decked out in their finery before joining a lively procession to the local monastery where the novice will be handed over by his or her parents to an elder monk to experience life in the monastery, studying ancient Pali scripts and Buddhist philosophy. King Anawrahta, the 11th century founder of the Pagan Empire, is credited with introducing Theravada Buddhism to Upper Burma. Visit the Ngat Pyit Taung pagoda and monastery built by the king and explore its impressive prayer hall and nearby temple caves. The monastery is also home to a primary school. Established by King Anawrahta, these monastic schools traditionally provided education in secular as well as Buddhist teachings. 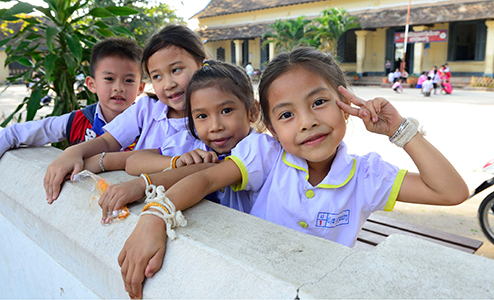 Today, they supplement the government schools by helping disadvantaged children acquire literacy and numeracy skills while learning Buddhist values such as generosity and kindness. You are welcome to donate school supplies during your visit. One of Luang Prabang’s must-see sights is the incredible Kuang Si Waterfalls, known for their picturesque cascades of vibrant blue water. 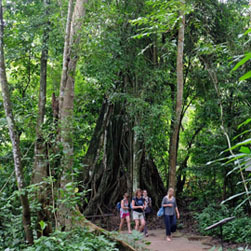 Approximately 29km (18mi) south of Luang Prabang, the jungle-clad waterfalls make for an excellent day of trekking, swimming and touring. Climb to the top of the three-tiered falls for spectacular views. 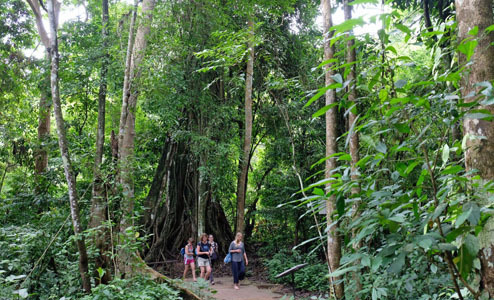 Along the way, learn some jungle survival skills from your expert guide as he teaches you how to identify herbs, mushrooms, bamboo shoots and other plants as well as how to fish the local way. Help prepare a traditional Lao jungle meal and enjoy a refreshing swim in one of the many natural pools. Also visit the Asian Bear Rescue Center, home to Sun Bears and Malayan Black Bears that have been rescued from bile farms or wildlife traffickers. While Laos isn’t usually associated with cheese, it makes perfect sense in this land full of buffalo. 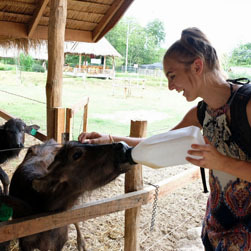 So began Buffalo Dairy Farm, a socially-responsible enterprise that partners with local farmers to care for and milk their female buffalo to make high-quality products such as yoghurt, cheese and ice cream for local and overseas consumers. 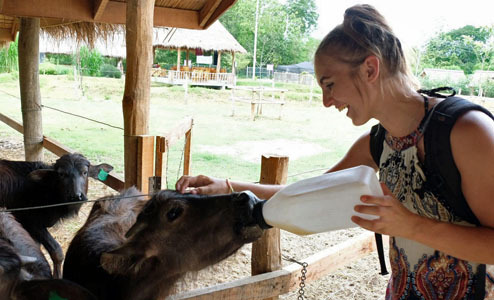 Change into farm clothes and boots for an exclusive, behind-the-scenes tour of the commercial dairy and production facility, helping to wash, feed and hand-milk a buffalo. Join an Australian chef for a mozzarella-making class with the option to take home the cheese you make. Relax in the cafe and enjoy breakfast (mornings) or canapés and a glass of wine (evenings) and take home a gift of buffalo cookies. 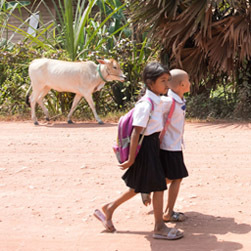 The literacy rate of Laos falls short of most of its Southeast Asian neighbours at just over 70% and is often even lower in rural areas where children must walk long distances to reach the nearest school. Other factors that add to the problem include poor-quality classrooms, limited teacher training and a dearth of appropriate reading materials. 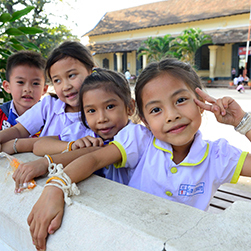 To help combat the issue, the Luang Prabang Public Library, in tandem with Cooperative Learning International, aims to bring books into the hands of children through its Lao Children’s Library Boats and Tuk-Tuk Library. Join the mobile library for an inspiring morning of visiting a village school with books, games and learning activities. See how hygiene is promoted through songs, stories and drama and help distribute a health bag containing soap, a toothbrush and other personal items or a learning bag with exercise books and pencils to the children. Just minutes from bustling Phnom Penh lies Koh Dach, a pair of rural islands on the Mekong River collectively known as “Silk Island”. 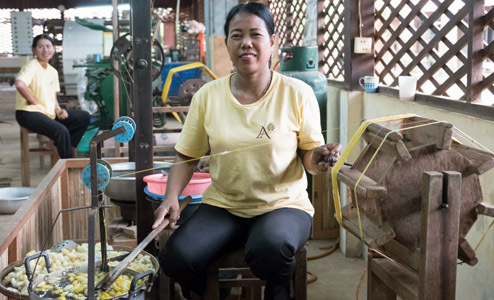 Spend the day with a local resident and her expat husband and explore the island known for its home-based silk weaving industry. With a background in creative arts, Sopheap will take you to homes specialising in handicrafts and food production, and provide fascinating insights into their livelihoods. Learn how to make your own noodles from a woman who has spent her life dedicated to perfecting their texture and flavour. Before departing the island, visit the very school Sopheap attended as a child, and meet with the headmaster to deliver school supplies that are very much in need. 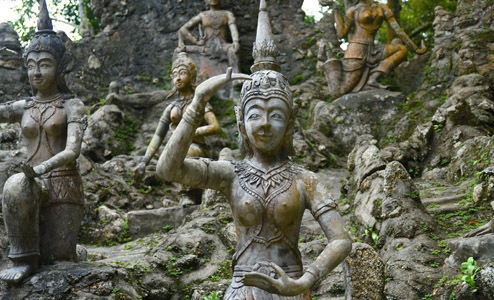 Ceramics have been produced in Cambodia since prehistoric times with glazed wares gaining popularity in Angkor between the 9th and 13th centuries. 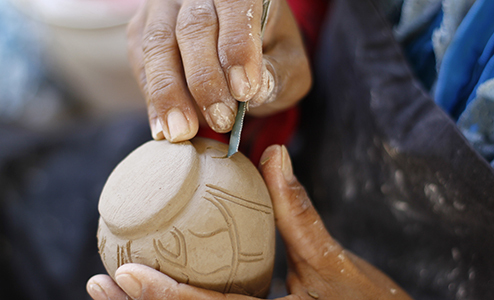 Founded in 2006 as the National Centre for Khmer Ceramic Revival, the Khmer Ceramic Centre is a non-profit, non-governmental organisation with a mission to revive the ancient art of Khmer pottery. The centre provides free vocational training to disadvantaged youths while renewing broader interest in this ancestral art. 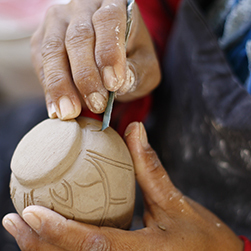 Spend a half day with a craftsman who will breathe life into the history of ancient Khmer pottery, including how bricks for the Angkor temples were thought to have been made. Then under his careful instruction, take your turn at the potter’s wheel using up to 5 lumps of fresh clay to create your very own piece of pottery. While the Angkor Wat Complex is truly extraordinary, it can be easy for adults to get “templed out”, much less kids. Spend a half day with the family exploring three of the things that kids like most: crafts, animals and good eats. 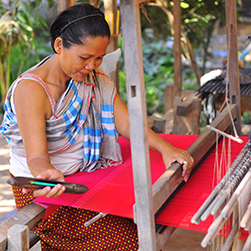 Visit a silk farm to see how fine Khmer silk is made, including feeding and taking care of the wriggly silk worms, spinning the silk threads, and weaving the silk into beautiful handmade garments. Next, visit the De-Mining Dog Show with its 50 Belgian Malinois dogs. Visitors can pet and play with these friendly yet highly-trained animals who use their incredible sense of smell to find explosives in former battlefields. Finally, feast on authentic Khmer food in a restaurant set amongst the scenic rice and flower fields of rural Siem Reap to wrap up an exciting family-friendly outing. Just 30km (19mi) from Siem Reap lies Anlong Pi, the province’s main dump site. The toxic landfill is also where hundreds of Cambodians, a third of whom are children, scavenge daily looking for recyclable materials to sell. While “tragedy tourism” has developed around Anlong Pi with some well-meaning visitors taking photos and giving gifts to the children, this only serves to perpetuate the cycle of poverty. 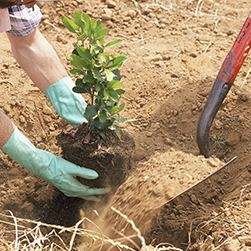 Instead, responsible travellers look to support the Anlong Pi Free School. Relying completely on donations, the school teaches an estimated 250 children aged 6-16 years old literacy, vocational and life skills including basic hygiene and safety. Part of your tour cost goes directly towards the daily needs of this population and the mango tree you plant will grow to feed these villagers for years to come. Outside of Siem Reap’s magnificent temples and tourist-friendly town centre, there are more than 140,000 people who call the town home. 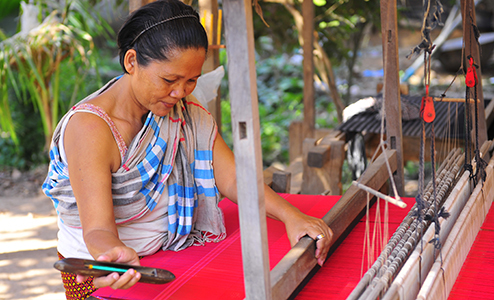 Venture away from the usual attractions for a taste of what 80% of Cambodia looks like with a visit to the rural village of Peak Sneng. 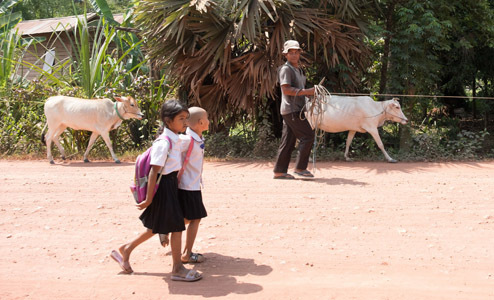 Immerse yourself in village life as you visit the local school and observe how teachers make the most of a very basic learning environment. Travel around the village by traditional vehicle and learn how to weave palm leaves into simple decorations. Best of all, a portion of your tour costs will directly benefit the village, helping to meet pressing needs such as a computer for the school or to repair the roof of an elderly villager’s home. Buffalo and cattle play a tremendously important role in the lives of rural farmers. 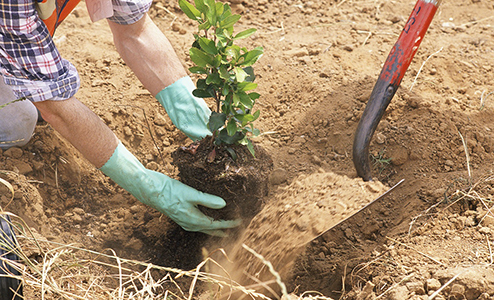 Because of their usefulness and high economic value, these animals are often treated as members of the family. 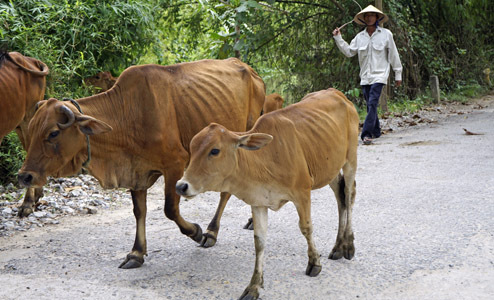 In addition to providing milk and meat, cattle are essential for working the land in rural Vietnam. They are allowed to roam freely during the day and eat herbs and grasses found around the village, minimising the upkeep of these animals. 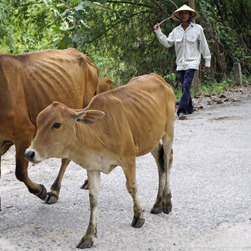 Travel to the outskirts of Hue and participate in a ceremony where you will donate a cow to a family of farmers, with local authorities and villagers as witnesses. Spend some time with the recipients of your life-changing gift and learn about their daily life and future plans, all made brighter by your generous donation. 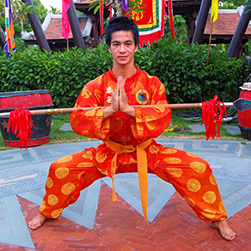 Martial arts in Hue originated as a way for mandarins to protect the royal court. 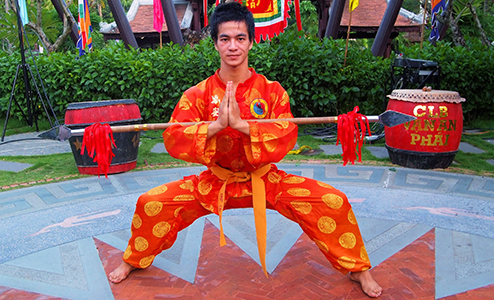 In time, a form of martial arts was taught to soldiers tasked with enlarging the territory of the Nguyen Lords in the 17th century. So revered were the martial arts masters that they were awarded Doctorates of Philosophy and King Minh Mang built a Martial Arts Temple not far from the Thien Mu Pagoda to honour these masters. Rediscover this ancient practice by visiting a martial arts school. Enjoy a private class with the head master and see how the gestures and sequences of Hue martial arts resemble the movements of animals defending themselves. Also tap into Master Kim’s comprehensive knowledge of the human body which he uses to treat injuries holistically.